A newly developed analytical method characterized by its speed and sensitivity for the determination of metoclopramide hydrochloride (MCP-HCl) in pure and pharmaceutical preparation via turbidimetric measurement (0-180o) by Ayah 6SX1-T-2D Solar cell-CFI Analyser. The method was based on the reaction of phosphomolybdic acid with metoclopramide hydrochloride in acidic medium to form yellowish white precipitate for the ion-pair complex. Turbidity was measured via the reflection of incident light that collides on the surface precipitated particles at 0-180o. Chemical and physical parameters were studied and optimized. The calibration graph was linear in the range of 0.0005-3 or 0.0005- 4 mMol.L-1, with correlation coefficient r = 0.9947&0.9845 respectively. The limit of detection 3.543 ng/sample from the step wise dilution for the minimum concentration in the linear dynamic ranged of the calibration graph with RSD% lower than 0.3% for 1, 3 mMol.L-1 (n=8) concentration of metoclopramide hydrochloride . The method was successfully applied to the determination of metoclopramide hydrochloride in three pharmaceutical drugs. A comparison was made between the newly developed method analysis with the classical method (HANNA instrument for turbidity measurement) using the standard addition method via the use of t-test. It was noticed that there was no significant difference between two methods at 95 % confidence level. طورت طريقة تحليلية جديدة ,تميزت بالسرعة والحساسية لتقدير الميتاكلوبراميد هيدروكلورايد بشكلة النقي او على هيئة مستحضرات صيدلانية عن طريق قياس التعكرية 0-180º بوساطة محلل الحقن الجرياني المستمرAyah 6SX1-T-2D Solar cell .استندت الطريقة على تكوين راسب ابيض مصفر لمزدوج ايوني بين الميتاكلوبراميد هيدروكلورايد وحامض مولبدات الفسفوريك في الوسط الحامضي . تم قياس التعكرية عن طريق انعكاس الضوء المسلط والمصطدم بسطوح دقائق الراسب بزاوية 0-180º. تم دراسة كافة المتغيرات الكيميائية والفيزيائية . مدى الخطية لمنحني المعايرة للميتاكلوبراميد هيدروكلورايد تمتد 0.0005 - 3 أو 0.0005 - 4 مللي مول. لتر-1 بمعامل ارتباط =0.9947 و 0.9845 على التوالي .حدود الكشف 3.543 نانوغرام /نموذج من التخفيف التدريجي لأقل تركيز في منحني المعايرة مع انحراف قيايس نسبي مئوي اقل من 0.3% لتركيز1,3 مللي مول .لتر -1 (n=8) من الميتاكلوبراميد هيدروكلورايد . طبقت الطريقة بنجاح لتعيين الميتاكلوبراميدهيدروكلورايد في ثلاثة مستحضرات صيدلانية . اجريت المقارنة بين الطريقة المستحدثة للتحليل والطريقة التقليدية لقياس التعكرية باستخدام الاضافات القياسية بوساطة اختبار t المزدوج ولوحظ انه لايوجد فرق جوهري بين الطريقتين عند مستوى قناعة 95 %. Density Functional Theory (DFT) at the B3LYP/6-311G basis set level was performed on six new substituted Schiff base derivatives of PINH [(phenylallylidene) isonicotinohydrazide], The calculated quantum chemical parameters correlated to the inhibition efficiency are EHOMO (highest occupied molecular orbital energy), ELUMO (lowest unoccupied molecular orbital energy), the energy gap [ΔE(HOMO-LUMO)], hardness (η), softness (S), dipole moment (μ), electron affinity (EA), ionization potential (IE), the absolute electronegativity (χ), Global electrophilicity index (ω) and the fraction of electron transferred (∆N), all have discussed at their equilibrium geometry and their correct symmetry (Cs). Comparisons of the order of inhibition efficiency of the Schiff bases derivatives, and local reactivity were analyzed using Mulliken population analysis. The local reactivity has been studied through condensed softness indices in order to predict both the reactive centers and to know the possible sites of nucleophilic and electrophilic attacks. Also vibration frequencies and IR absorption intensities were carried out for the calculated Schiff bases molecules. Also some physical values were studied such as heat of formation and total energy. تضمن البحث استخدام نظرية دوال الكثافةDFT الأساسية غير التقريبية لعناصر قاعدة6-311G وباسلوب B3LYP وباستخدام برنامج Gaussian-03 في حساب الشكل الهندسي التوازني لستة من قواعد شف الجديدة المشتقة من المركب PINH [(phenylallylidene) isonicotinohydrazide], التي وجد امتلاك معظمها للتماثل Cs. وتم حساب ومناقشة معاملات اميكانيك الكم المرتبطة بدراسة كفاءة هذه المركبات كمثبطات تاكل مثل طاقة اعلى مدار محجوز بالالكترونات EHOMO، وطاقة اوطأ مدار غير محجوز بالالكترونات ELUMO، والفرق الطافي بينهما ΔEHOMO-LUMO، وتوزيع الكثافة الالكترونية والصلادة وعزم ثنائي القطب والالفة الالكترونية وجهد التأين والليونة وكسر الانتقال الالكتروني مع تعيين مواقع الامتزاز الفعالة، عند الشكل الهندسي التوازني وعند التماثل الصحيح لهذه الجزيئات. كما تم حساب وتصنيف ترددات اهتزاز طيف الأشعة تحت الحمراء وبعدد 3N-6 وادراج الاهم منها. كذلك تمت دراسة بعض القيم الفيزياوية كحرارة التكوين والطاقة الكلية. The synthesis and characterization of new complexes of Cr(III), Fe(III), Co(II), Ni(II), Cu(II) and Zn(II) with bidentate [L1: 2-phenyl-2-(p-tolylamino) acetonitrile] and [L2: 2-phenyl-2-(phenylamino) acetonitrile] ligands has been described. The two ligands were prepared by the reaction of p-toluidine and aniline with benzaldehyde, respectively in the presence of potassium cyanide and acidic medium. The complexes were synthesized by treating an ethanolic solution of the ligand with metal salts in a mole ratio of [1:2] [M:L]. The complexes were characterized by using metal and elemental analyses, electronic spectra, 1H-NMR, 13C-NMR, Thermal Gravimetric Analysis TGA, molar conductivity and magnetic susceptibility. According to the obtained data the probable coordination geometries of metal ions in these complexes were suggested as octahedral. Some complexes were found to be non-electrolyte others were found to be weak electrolyte in ethanol. تضمنت هذه الدراسة تحضير وتشخيص معقدات جديدة ل ( Cr(III،( Fe(III، Co(II)، Ni(II)، Cu(II)، Zn(II) مع ليكاندين ثنائية السن ] 2-فنيل-2-(بارا- توليلامينو) و2-فنيل-2-(فنيل امينو) اسيتونتريل [ اللذين تم تحضيرهما من تفاعل الباراتوليودين والانيلين مع البنزلدهايد على التوالي بوجود KCN في محيط حامضي. حضرت المعقدات من خلال معاملة الليكاند مع املاح العناصر بنسبة مولية [2:1] ]ملح:ليكاند[. شخصت المعقدات من خلال التحليل الدقيق للعناصر و مطيافية الامتصاص الذري و اطياف الاشعة تحت الحمراء و بروتون الرنين النووي المغناطيسي ونظير الكاربون13 للرنين النووي المغناطيسي والتحليل الحراري الوزني و التوصيلية المولارية والحساسية المغناطيسية. طبقآ للبيانات التي تم الحصول عليها تم اقتراح الاشكال الهندسية المحتملة لهذه المعقدات على انها ثمانية السطوح. بعض المعقدات وجدت غير الكتروليتية والبعض الآخر وجدت بشكل الكتروليت ضعيف في الايثانول. A series of coordination compounds of Zr(IV), Cd(II) and Sn(II) ions with 4-(((3-mercapto-5-phenyl-4H-1,2,4-triazole-4-yl)imino)methyl)-2-methoxyphenol, as a ligand has been successfully prepared in alcoholic medium. The prepared complexes were characterized quantitatively and qualitatively by using: elemental analysis CHNS, FT-IR spectroscopy, UV-visible spectroscopy, 1H and 13CNMR, atomic absorption measurements, magnetic susceptibility, thermal analysis)TG and DTG) and conductivity measurements. This ligand coordinates as a bidentate that to the metal ions through sulphur and nitrogen of (azomethine group) atoms. According to the spectral data, Cd(II)- and Sn(II)-complexes have coordination of 6 with octahedral geometry while the Zr(IV)-complex has coordination of 7 with exhibited a pentagonal bipyramid. في هذا البحث تم تحضيرسلسلة من المركبات التناسقية للايونات القصدير(II) والكادميوم (II) والزركونيوم (IV) مع الليكاند 4-(((3-مركبتو-5-فنيل-1’2, 4-ترايازول-4-امينو)مثيل)-2-ميثوكسي فينول) الذي تم تحضيره باستخدام الايثانول كوسط للتفاعل . شخصت المعقدات المحضرة كميا ونوعيا باستخدام تحليل العناصر, CHNSطيف الاشعة تحت الحمراء , طيف الاشعة فوق البنفسجية-المرئية ,الرنين النووي المغناطيسي ,الامتصاص الذري,الخاصية المغناطيسية ,التحاليل الحراريه وقياس التوصيلية . يتناسق هذا الليكاند مع الفلز عن طريق ذرتي الكبريت والنيتروجين . طبقا للنتائج الطيفية المستحصلة ,معقدات القصدير(II) والكادميوم(II)سداسية التناسق وبشكل هندسي ثماني السطوح اما معقد الزركونيم(IV) فيكون سباعي التناسق وشكله الهندسي ثنائي الهرم خماسي القاعدة. Hydrogen peroxide was determined by a new , accurate , sensitive and rapid method via continuous mode of FIA coupled with total luminescence measurement which include the chemiluminescence generated ,based on the oxidation of Luminol which is loaded on poly acrylic acid gel beads by hydrogen peroxide in presence of Cobalt (II) ion as a chemiluminescence catalyst and the fluorescence that was created by the insitu radiation of the released chemiluminescence light. Fluorescien molecule was used as an accepter fluorophore where it is irradiated internally and instantly by the generation of luminol chemiluminescence light as internal source for irradiation of fluorescien molecule (Fluorescence Energy Transfer (FRET) ) . It can easily give fluorescence light (i.e , no external source for irradiation is used ) at λmax =530 nm. The method is based on the absorbance of the donor molecule (Luminol) by fourteen poly acrylic acid gel beads located in specially designed cell, this cell will measure instantly the emitted light (FRET) . A sample volume of 80 μL was used throughout the whole work. Linear calibration curve extend from 0.1 - 100 μMol .L-1 , with correlation coefficient of 0.9985 and limit of detection L.O.D (S/N =3) 217.60 pg/sample using step wise dilution of the minimum concentration that was achieved by the calibration graph. Repeatability (RSD%) of less than 0.5% for six successive measurement of 50 μMol .L-1 of hydrogen peroxide. The method was applied successively in determination of hydrogen peroxide in some pharmaceutical disinfectants . قدر بيروكسيد الهيدروجين بطريقة جديدة ومضبوطة وحساسة وسريعة عن طريق نمط التحليل بالحقن الجرياني المستمر والمزدوج مع قياس التألق الكلي والذي يتضمن توليد البريق الكيميائي بالاستناد على اكسدة اللومينال المحمل على حبيبات الجل لمتعدد حامض الاكريلك بوساطة بيروكسيد الهيدروجين بوجود ايون الكوبلت (II) كعامل مساعد للبريق الكيميائي ، اما الفلورة والتي تنشأ بوساطة التشعيع الأني لضوء البريق الكيميائي المتحرر بأستخدام الفلورسين كجزيئة فلوروفورية والتي بدورها تشعع داخلياً وأنياً من ضوء البريق الكيميائي للومينال والمستخدم كمصدر داخلي لتشعيع جزيئة الفلورسين . لذلك بالأمكان اعطاء ضوء الفلورة (يعنى ذلك لايوجد مصدر داخلي للتشعيع) عند 530 نانومتر . تستند الطريقة على امتصاص الجزيئة الواهبة ( اللومينال ) بوساطة 14 حبة جل من حامض متعدد الاكريلك والمحتواة في خلية بتصميم خاص والتي تمثل خلية القياس الأني بعد تحرير اللومينال من حبيبات الجل . 80 مايكرولتر حجم مقطع الانموذج المستخدم خلال العمل الحالي . يمتد منحني المعايرة من 0.1 - 100 مايكرولتر . لتر-1 بمعامل ارتباط 0.9985 وحدود كشف (S/N=3) 217.60 بكغم / انموذج بأستخدام التخفيف التدريجي لأقل تركيز في منحني المعايرة . التكرارية اقل من 0.5 % لست حقنات متتالية لتركيز 50 مايكرومول . لتر -1 . طبقت الطريقة بنجاح في تقدير بيروكسيد الهيدروجين في بعض المطهرات الصيدلانية . Chemiluminescence --- Flow injection analysis --- gel beads --- hydrogen peroxide --- in situ fluorescence. In order to study the correlation between CMV infection and increase in blood pressure among Iraqi patients, 201 blood samples were collected including; 88 male, 113 female hypertensive patients and 40 control samples. Patients sera were grouped into patients who are under medication (T), and patients who do not take any treatment for hypertension(NT). Samples were tested for CMV-IgM/IgG by ELISA, renin enzyme and interleukin-6(IL-6) levels were determined by ELISA too. The optical density readings difference for CMV-IgG were significant between (T) and (NT) groups as well as when each group compared to control, level of renin en-zyme showed significant difference between patients group(T and NT) and between each group compared to the control, (135 ± 98), (201 ± 102) and (130 ± 90) respec-tively, while IL-6 level was not significant either between the groups nor within the group. Furthermore, there was a positive correlation between the optical density readings of (NT) group for CMV-IgG and renin enzyme level with the systolic and diastolic blood pressure with r-value ranged (0.4-0.6). This study may high light on the role of previous infection or re-infection by CMV and increase in blood pressure. لهدف دراسة العلاقة بين الاصابة بفيروس المضخم للخلايا((CMV وضغط الدم عند المرضى العراقيين تم جمع(201) عينة دم وكان عدد الذكور(88) وعدد الاناث (113) من المرضى المصابين بارتفاع ضغط الدم و(40) عينة سيطرة. وقد قسمت مصول المرضى الى مجموعتين:مجموعة المرضى الخاضعين للعلاج(T) ومجموعة المرضى غير الخاضعين للعلاج(NT), وتم اختبار العينات والتحري عن وجود فيروسCMV)) للاجسام المضادة IgG, IgM من خلال اختبار ELISA)) وكذلك تم قياس مستوى كل من انزيم الرنين وانترلوكين (IL-6) بواسطة ELISA)) ايضا, وقد اعطت قراءات الكثافة الضوئية(optical density) فرقا معنويا بين المجموعتين (T) و(NT) مقارنة مع مجموعة السيطرة بالنسبة CMV-IgG حيث كانت القراءات كالاتي: (98±135) ,(102±201) , (90± 130) على التوالي, اما بالنسبة للانترلوكين (IL-6) كانت القراءات غير معنوية. بالاضافة الى ذلك تم ايجاد علاقة موجبة بين قراءات الكثافة الضوئية لمجموعة(NT) بالنسبة CMV-IgG وانزيم الرنين مع كل من الضغط الانقباضي والانبساطي بقيمة r بين (0.6-0.4). هذه الدراسة سلطت الضوء على تأثير الاصابة المسبقة او تكرار الاصابة بالفيروس المضخم للخلايا(CMV) واحتمالية علاقته بارتفاع ضغط الدم. Cytomegalovirus (CMV) --- Hypertension --- Renin-enzyme --- renin–angiotensin-system (RAS) --- angiotensin-II. Seventy-six urine specimens were collected from of patients suffering from recurrent urinary tract infections (UTIs). Specimens were bacteriologically analyzed, fifty (65.8%) of isolated bacterial strains were belonged to E.coli. 100% of isolated uropathogenic E.coli (UPEC)strains displayed a biofilm positive phenotype under optimized condition using microtiter plate assay. 21 of E.coli strains classified as highly positive biofilm producers (42%), and 29 (58%) as weakly positive biofilm producers. جمعت 76 عينة ادرار سريرية من مرضى يعانون من خمج المسالك البولية المتكررة, فحصت العينات بكتريولوجيا. وجد ان 50 (65.8%) تعود لبكترياE.coli . أظهرت كل عزلاتE.coli المختبرة القدرة على تكوين الأغشية الحيوية 100% )) بأطباق المعايرة الدقيقة . صنفت 21 عزلة (42%)عالية الانتاجية في تكوين الغشاء الحياتي و 29 (58%) كونها ضعيفة الانتاجية . Uropathopathogenic E.coli (UPEC) --- Biofilm --- Microtiter plate. Fifty isolates of Bacillus spp were obtained from rhizosphere soil of compositae plant roots. The ability of inulinase production by these isolates was screened. Bacillus Be9, which isolated from soil of lettuce root, was the highest inulinase producer; it was identified as Bacillus cereus. Optimal culture medium and condition for inulinase production were determinatd; the highest inulinase production was obtained when the bacteria was cultured in inulin medium which contained 0.5% inulin, 0.4% peptone as carbon and nitrogen source at pH 7.0 inoculated with 1ml of bacterial suspension and incubated at 40˚C for 48hrs. تم الحصول على 50 عزلة بكتيرية تنتمي الى جنس ال Bacillus من التربة المحيطة بجذور نباتات العائلة المركبة واختبرت قدرة هذه العزلات على انتاج انزيم الانيولينيز, وبينت النتائج ان العزلة Bacillus Be9 المعزولة من تربة الخس هي اكفأ عزلة منتجة للانزيم وقد شخصت على انها احدى سلالات Bacillus cereus . تم تعيين الظروف المثلى لانتاج الانزيم ووجد ان افضل وسط لانتاج الانزيم هو وسط الانيولين اللذي يحتوي على 0.5% من الانيولين و 0.4% من الببتون كمصدر للكاربون وللنتروجين عند الرقم الهيدروجيني 7 ولقح ب 1مل من عالق الخلايا البكتيرية وحضن بدرجة 40 مo ولمدة 48 ساعة. Soil samples from fields cultivated with barley and wheat in addition to samples from spoiled orange and apple fruits and carrot roots were collected with the aim to isolate cellulase producing bacterial strains. Bacterial isolates obtained from these samples were grown on a selective medium containing carboxymethyl cellulose (CMC) as a sole source for carbon and energy. Results showed that nine isolates out of fifty were able to produce cellulase.The specific activity of cellulase in culture filtrate of the most efficient isolate was 1.601 u/mg protein.This isolate was identified according to its morphological characteristics and biochemical tests, and then by using Api 20-E and VITEK-II identification systems and was identified as Pantoea dispersa. Cellulase produced by P. dispersa was purified throughout four purification steps including ammonium sulfate precipitation, dialysis followed by purification with ion exchange chromatography using DEAE-cellulose, and then gel filtration throughout sephadex-G200. Purification results showed that the specific activity of the purified enzyme was 1181.8 u/mg protein with a purification fold and yield 115.2 and 26.6% respectively. Purified cellulase from Pantoea dispersa was well characterized by studying some enzyme characteristics. The molecular weight of cellulase was 15148 dalton, and pH 7.0 was the optimum for enzyme activity and stability, while 30 ºC was the optimum for enzyme activity and stability. جمعت عينات من التربة المزروعة بالحنطة والشعير بالإضافة إلى عينات من فاكهة البرتقال والتفاح وجذور الجزر التالفة، بهدف عزل سلالات بكتيرية منتجة للسيليليز . نميت العزلات البكترية المعزولة من هذه العينات على أوساط انتحابية متضمنة carboxymethyl cellulose كمصدر وحيد للكربون والطاقة . أظهرت النتائج إن 9 عزلات من بين 50 عزلة قادرة على إنتاج السيليليز. كانت الفعالية النوعية للسيليليز في الراشح البكتيري للعزلة الأكثر كفاءة هو 1.601 وحدة/ملغم بروتين. شخصت العزلة اعتمادا على الصفات المظهرية والاختبارات الكيميوحيوية ثم باستعمال Api 20-E و VITEK II وكانت العزلة هي Pantoea dispersa . تمت تنقية السيليليز المنتج من قبل هذه العزلة بأربع خطوات تنقية وهي الترسيب بكبريتات الامونيوم والديلزة ثم التنقية بالمبادل ألايوني DEAE-Cellulose ثم بالترشيح الهلامي خلال Sephadex G200 . اظهرت النتائج فعالية نوعية للإنزيم المنقى 1181.8 وحدة/ملغم بروتين مع عدد مرات تنقية 115.2 وحصيلة 26.6%. تم توصيف الإنزيم المنقى للعزلة Pantoea dispersa من خلال دراسة بعض صفات الإنزيم إذ كان الوزن الجزيئي للإنزيم هو 15148 دالتون، والرقم الهيدروجيني الامثل لفعالية وثبات الإنزيم هو 7، بينما درجة الحرارة 30 °م هي الأمثل لفعالية وثبات الإنزيم . Cellulase --- Pantoea dispersa --- cellulose degrading bacteria. 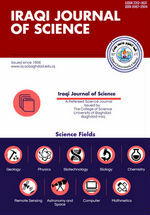 This study included the compromised the containing Hardness and some ions of treated water in central Karbala drinking water treatment station with Iraqi and international drinking water criteria. Also, this study was attempted to focus on probable pollution sources. The Hardness and other waters salts Sulphates (SO4), Chloride ion (Cl-), Calcium ion (Ca+2), and Magnesium ion (Mg+2) tests criteria were determined on water samples taken from Al-Hussainia River water source, treated drinking water during October-November 2013 to August - September 2014.Study results revealed an increasing in Total hardness (TH), sulfate, chloride, calcium, in winter (December- January) 2014. In addition, the results showed a decrease in above mentioned criteria in (August-September) 2014.Study finding revealed that the values of chloride, calcium, sulphate, were out of the Iraqi and the international standards water. While total hardness, magnesium, and chloride concentrated were within Iraqi and international acceptable standards. شملت الدراسة تقييم محتوى المياه من العسرة وعدد من الأيونات مع معايير مياه الشرب العراقية والدولية. كما شملت الدراسة عدد من الفحوصات مثل العسرة والكالسيوم والمغنيسيوم والكلورايد والكبريتات لعينات المياه المأخوذة من مصادر المياه نهر الحسينية ومحطة كربلاء المركزية لتصفية مياه في المدينة خلال أكتوبر-نوفمبر 2013 إلى أغسطس - سبتمبر 2014. كما وكشفت نتائج الدراسة إلى زيادة في العسرة والكالسيوم والمغنيسيوم والكلورايد والكبريتات في فصل الشتاء وانخفاضها في الاشهر الحارة وخصوصاً (أب وأيلول). كما كانت قيم الكلوريد، والمغنيسيوم، والكبريتات أعلى من المواصفة العراقية و الدولية، بينما العسرة الكلية والمغنيسيوم ضمن المواصفات العراقية والعالمية. Drinking water --- Karbala --- Hardness and Salts. Leishmania are protozoan parasites belonging to the family Trypanosomatidae that cause high morbidity and mortality levels with a wide spectrum of clinical syndrome. This study aimed to investigate the effect of liposomal amphotericin B (AmBisome) drug on promastigote and axenic amastigote stages of Leishmania tropica. From the 20 isolates of cutaneous leishmaniasis collected from patients attended to the AL-Karama Teaching Hospital in Baghdad during the period from October 2013 until February 2014, only three isolates successfully transformed to motile promastigote stage in the culture media. The most active one is included in this study. Different concentrations of liposomal amphotericin B (AmBisome) and pentostam Sb (V) drugs were investigated against Leishmania tropica promastigote and axenic amastigote. The IC50 values of SbV and AmBisome drugs on promastigote were 5.42 mg/ml and 2.14 µg/ml, respectively, while they were 0.88µg/ml and 0.75 µg/ml respectively, for axenic amastigote. The present study concluded that axenic amastigote was more sensitive than promastigote against both drugs, and AmBisome drug showed high effectiveness against both stages with low concentrations in comparison with pentostam. الليشمانيا طفيليات ابتدائيه تعود الى عائلة المثقبيات التي تسبب معدلات عاليه من الامراضيه والوفيات مع مدى واسع من الاعراض السريريه .هدفت الدراسه الى اختبار فاعلية عقار الامفوترسين الشحمي على الطور امامي السوط وعديم السوط خارج الخلوي لليشمانيا الجلديه. تم عزل 20 عينه ليشمانيا جلديه من المرضى المراجعين لمستشفى الكرامه التعليمي في بغداد للفتره من تشرين الثاني 2013 الى شباط 2014 وقد نجحت ثلاث عزلات فقط في التحول الى الطور امامي السوط المتحرك في الوسط الزرعي واختيرت العزله الاكثر نشاطا" لاستخدامها في هذه الدراسه .اختبرت تراكيز مختلفه من عقار البنتوستام والامفوتيرسين الشحمي ضد الطورين الامامي السوط وعديم السوط خارج الخلوي من اللشمانبا الجلديه و كانت قيم IC50لهذين العقارين هي 5.42 ملغم /مل و2.14 مايكروغرام /مل للطور الامامي السوط على التوالي بينما كانت قيمها 0.88 مايكرو غرام /مل و 0.75 مايكرو غرام /مل للطور عديم السوط على التوالي. اظهرت النتائج ان الطور عديم السوط خارج الخلوي اكثر حساسيه تجاه العقارين من الطورامامي السوط, وأن الامفوتيرسين الشحمي فعال ضد الطورين وبتراكيز اقل منها للبنتوستام. Effect of Bio-chemical Fertilizer on Proline Accumulation, Catalase and Peroxidase Enzymes Activity in Leaves of Two Wheat Cultivars (Ipa99 and Rabyaa) Under Water Deficit Stress. Field experiment was carried out during 2013- 2014 at the research field of the Department of Biology, College of Science, Baghdad University, to study the effect of bio-chemical fertilizers and chemical fertilizers on some agronomic traits and yield components of two wheat cultivars (IPA99 and Rabyaa) under drought stress conditions. The bio-chemical fertilizers were mixture of (Azotobacter chroococcum. Azospirillum brasilense. and Pseudomonas fluorescens.) with chemical fertilizers (only 50% of the recommended dosage of N and P), while the chemical fertilizers was 100% of recommended dosage of N and P. Field plots (1×1 m) were randomly made in the field equipped with rainfall shelter to avoid rains. Grains of wheat cultivars were sown manually in their respective plots in rows with a distance of 20 cm between rows and at seed rate of 3 g per row (150 kg/ha). The experiment was conducted in randomized complete block design (RCBD) under split plot arrangement with five replications. Adding fertilizer were kept in the sub plot, while water stress treatment was assigned as main plot. The data were analyzed by analysis of variance (ANOVA). Water stress was applied by irrigated the plots to the soil field capacity then withheld next irrigation until the soil moisture of the respective plots depleted to 80 (control), 30 % of soil field capacity. The results also showed significant decrease antioxidant enzymes activity with the decreased water stress. Also, the antioxidant enzymes activity (CAT and POD) were more activity after 107 days than 65 days because of no irrigation for harvesting preparation. Besides, at high drought level, the response of the antioxidant enzymes activity (CAT and POD) and proline accumulation were similar to that observed in control treatment, while with bio-chemical fertilizers the significant decreased respectively. These bio-chemical fertilizers would play key role in productivity and sustainability of protect the environment as eco-friendly fertilizers and cost effective inputs for the farmers. With using bio-chemical fertilizers that contain different microbial strains has led to decrease in the use of chemical fertilizers, which can be help achieving sustainability of farms and with no harmful agrochemicals for human safety. نفذت تجربة حقلية خلال الموسم الزراعي 2013 -2014 في حقل الأبحاث التابع لقسم علوم الحياة في كلية العلوم، جامعة بغداد لدراسة تأثيرات الاسمدة العضوية و الكيمائية على بعض الصفات الخضرية والحاصل لصنفين من الحنطة ( اباء وربيعة ) تحت تأثير شدود مختلفة لماء التربة . تضمن توليفة السماد العضوي ثلاث انواع من البكتريا وهي (Azotobacter chroococcum. Azospirillum brasilense., Pseudomonas fluorescens.) مع 50 % من سمادي النيتروجين والفسفور وحسب الجرع الموصى بها للحنطة ، في حين تضمن معاملة التسميد الاخرى استخدام 100 % من الاسمدة النيتروجينية والفوسفاتية . حرثت وسويت تربة الحقل وقسمت إلى ألواح بإبعاد 1x1 م، ثم بذرت حبوب الأصناف يدويا في المكان الخاص بها في الألواح على شكل خطوط بطول متر وبمسافة 20 سم بين خط وآخر وبنسبة بذار3غم لكل خط (150 كغم/هكتار). فصلت الألواح فيما بينها بطبقة من البلاستك أنزلت في التربة بعمق 35 سم لمنع الحركة الأفقية للماء بين ألواح التربة. أجريت التجربة باستخدام تصميم الألواح المنشقة بترتيب القطاعات العشوائية الكاملة وبخمسة مكررات لكل معاملة. احتلت معاملة التسميد الألواح الثانوية بينما احتلت معاملات الشد المائي الألواح الرئيسية. طبق الشد الرطوبي بسقي الألواح وصولا إلى السعة الحقلية للتربة، وبعد ذلك حجبت السقية التالية إلى حين استنزاف رطوبة التربة لألواح المقارنة إلى 80 % وألواح الشد الجفاف30 % من السعة الحقلية للتربة على التوالي .أظهرت النتائج انخفاض ملحوظ لنشاط الانزيمات المضادة للأكسدة مع زيادة الإجهاد المائي. كما أن مضادات الأكسدة الانزيمات النشاط ( الكتليز و البيروكسيديز) كانت أكثر نشاطا وربما يعود ذلك لعدم ري النباتات قبل الحصاد. الى جانب ذلك، ومع زيادة الجفاف، زادة فعالية الانزيمات المضادة للأكسدة ( الكتليز و البيروكسيديز ) كما زادة كمية البرولين في الاوراق لكلى الصنفين ولجميع المعاملات بما فيها معاملة السيطرة، بينما و مع اضافة الأسمدة الحيوية و الكيميائية انخفضت فعالية الانزيمات بشكل كبير على التوالي. اظهرت الدراسة امكانية ان تلعب الاسمدة الحيوية الكيمياوية دورا فعالا في ادامة خصوبة التربة وان تكون صديقة البيئة لاحتوائها على ميكروبية مختلفة تساعد النباتات للحصول على العناصر الغذائية وزيادة تحملها لبعض الاجهادات البيئة للتقليل من خطر تلوث البيئة بالأسمدة الكيميائية لضمان سلامة الانسان . Shisha smoke represents one of the causes of indoor air pollution. Heavy metals represent the main components in shisha smoke. In this research study, the indoor concentrations of heavy metals in shisha smoke café sites was investigated, samples were taken from two café sites (site1, site 2) which differ in their volume. Site1 volume was 77m3, while site 2 was 437.5m3. Sample were taken by using a low volume sampler (sniffer), and then examined by the Atomic Absorption Spectrometry (AAS). The results showed that indoor air shisha smoke samples for both experimental sites have shown a significant amount of heavy metals as compared with control sampling values. The mean concentration values of (Pb, Zn, Co, Ni, Cr) in site 1 were (11.004, 9.544, 24.088, 19.84, 24.98 µg/m3) respectively, while the mean concentration values of these heavy metal in site 2 were (5.574, 6.578, 16.684, 26.114, 9.636 µg/m3) respectively. Results and conclusions referred those indoor air concentrations during shisha smoking times were high and exceed the WHO standard limits. يعد دخان الشيشه احد مسببات تلوث الهواء الداخلي , وتمثل المعادن الثقيله احدى اهم مكونات دخان الشيشه . تم التحري في هذه الدراسه البحثيه عن تراكيز المعادن الثقيله للهواء الداخلي في مقهيين (موقع 1,موقع 2) واللذان يختلفان في حجم الصاله الداخليه ,كان الحجم الداخلي لصاله المقهى الاول 77م3 وكان الحجم الداخلي لصاله المقهى الثاني 437,5 م3. تم استخدام جهاز اخذ نماذج الهواء قليله الحجم (sniffer) ثم تم فحص النماذج باستخدام جهاز التحليل الطيفي للامتصاص الذري (AAS) . اشارت النتائج الى ان نماذج دخان الشيشه في كلا الموقعيين سجلت زياده معنويه في تراكيز المعادن الثقيله مقارنه بقيم نماذج السيطره , وكانت معدلات تراكيز العناصر(Pb, Zn, Co, Ni, Cr) للموقع الاول كانت (11.004, 9.544, 24.088, 19.84, 24.98 µg/m3)على التوالي , بينما كانت معدلات التراكيز لتلك العناصر في الموقع الثاني (5.574, 6.578, 16.684, 26.114, 9.636 µg/m3) على التوالي. ان هذه النتائج تشير بشكل واضح الى ان الهواء الداخلي لصالات المقاهي خلال اوقات اشغالها من قبل مدخني الشيشه يمتلك تراكيز عاليه للمعادن الثقيله , وان هذه التراكيز تفوق التراكيز القياسيه المحدده من قبل منظمه الصحه العالميه. Heavy metals --- Shisha smoke --- Indoor air cafes. Eight isolates of P. aeruginosa were obtained out of 90 water samples. The isolated colonies were identified based on their morphology and biochemical characteristics, were confirmed as P. aeruginosa by the API 20E test system. The percentages of P. aeruginosa recovery in this study were 8.8%. All isolates were able to produce greenish blue pigment (pyocyanin). Pyocyanin at all concentrations was significantly increased the percentage of fragmented DNA of peripheral blood lymphocyte cells compared to control , results showed that DNA fragmentation percentage was higher in concentration 50 μg/ml (70%,74.3%) at 24 hr,48hr respectively. In summary, results of recent study demonstrate that the pyocyanin, induces apoptosis of human peripheral blood lymphocytes تم الحصول على ثمانية عزلات من بكتريا P. aeruginosa من 90 نموذج ماء الشرب. تم تشخيص العزلات اعتمادا على الصفات المظهرية والكيموحيوية ثم اكد بنظام ابي .نسبة عزل البكتريا في هذه الدراسة كانت 8.8% وجميعها منتجة للصبغة الخضراء المزرقة ( البايوسيانين) . جميع تراكيز البايوسيانين حفزت تجزئة دنا الخلايا اللمفاوية مقارنة بالسيطرة وكانت نسبة التجزئة اكبر بتركيز 50 مايكروغرام بالمليليتر(70%و74.3% ) عند فترة حضن 24, 48 ساعة . اظهرت نتائج الدراسة الحالية ان البايوسيانين يحفز عملية القتل المبرمج لخلايا اللمفاوية في الدم. Pyocyanin --- P. aeruginosa --- DNA fragmentation --- apoptosis. Tigris River receives many pollutants while passing through Baghdad province due to increasing of population, discharge of untreated industrials, agricultural wastes on the river. The present study was conducted from January 2013 to December 2013 on the Tigris River starting from Al-Muthana Bridge to Al-Zaufurania city before it's jointed with Diyalla Tributaries. Six stations were chosen on the Tigris River along Baghdad city. The study was included measuring the bimonthly concentrations and distributions of polycyclic aromatic hydrocarbons (PAHs) in the samples of surface water. The sixteen polycyclic aromatic hydrocarbons (PAHs) listed by USEPA as priority pollutants (Naphthalene, Acenaphthalene, Acenaphthene, Fluorene, Phenanthrene, Anthracene, Flouranthene, Pyrene, Benzo(a)anthracene, Chrysene, Benzo(b)flouranthene, Benzo(k)fluoranthene, Benzo(a)pyrene, Pyrene, Dibenzo(a,h)anthracene, benzo(g,h,i)perylene and Inden(1,2,3-cd)pyrene) were detected. The highest value of total PAHs was 0.279 ppm recorded during August 2013 whereas the lowest value was 0.007 ppm during October 2013 at Al-Durah power plant discharge sit. The lowest value of (0.0002) ppm was recorded for Fluorene and Fluoranthene, while the highest value of (0.2) ppm for Naphthalene at Al-Durah power plant sit. يستلم نهر دجلة العديد من الملوثات خلال مرورهِ في مدينة بغداد بسبب الزيادة في الكثافة السكانية وقذف المخلفات (غير المعالجة) الصناعية والزراعية بشكل غير مراقب في مياه النهر.أجريت الدراسة الحالية للفترة من كانون الثاني 2013 ولغاية كانون الاول 2013,على نهر دجلة ابتداءً من جسر المثنى الى منطقة الزعفرانية قبل التقاءهِ برافد ديالى بحوالي 10 كم وبواقع 6 محطات موزعة على طول النهر داخل مدينة بغداد. اجريت النمذجة كل شهرين ولمدة اثنى عشر شهراً. تم تحديد ستة عشر مركباً من المركبات الهيدروكاربونية الحلقية المتعددة الانوية والمدرجة ضمن قائمة الملوثات الاولية من قبل وكالة حماية البيئة USEPA وهي: نفثالين ,اسنفثالين, اسينفثين, فلورين, فيناثرين, انثراسين, فلورانثين, بايرين, بنزو(أ) انثراسين, كرايسين, بنزو(ب) فلورانثين, بنزو(ك) فلورانثين, بنزو(أ) بايرين, ثنائي بنزو( أ,ه)انثراسين, بنزو( ج,ه,ا) بيرلين, اندين(1,2,3) بايرين. وقد بلغت اعلى قيمة للهيدروكاربونات الاروماتية المتعددة الانوية الكلية 0.279 جزء بالمليون خلال شهر اب واقل قيمة 0.007 جزء بالمليون خلال شهر تشرين الاول 2013 عند موقع محطة كهرباء الدوره. سجل في الماء اقل تركيز (0.0002 جزء بالمليون) للفلورانثين والفلورين بينما سجل اعلى تركيز (0.2 جزء بالمليون) للنفثالين عند نفس الوقع. PAHs --- petroleum --- oil spill --- Tigris River. A total of 47 samples were collected from different clinical specimens (urine, wounds, burns, sputum, blood, stools) during the period from November 2013 to January 2014, only 18 isolates (38.29%) were identified as Klebsiella pneumoniae ,11isolates (23.4%) as E. coli , 9 isolates (19.1%) as S. aureus, 3isolates (6.3%) as Psedomonase spp., 2 isolates (4.2 %) as K. terrigena and 4 isolates (8.5%) as K. oxytoca. The results were shown the elevation of K. pneumoniae percentage among the bacterial isolates depending on cultural, microscopically, biochemically characteristics and confirmed by using the API 20E and VITEK 2 system . Also K. pneumoniae isolates were more frequently in sputum samples then burns, stools , urine, wounds ,and blood in different percentages (33.3%, 16.6%, 16.6%، 11.1%، 11.1%، 11.1%) respectively. The in vitro sensitivity tests of K. pneumoniae isolates against (19) antimicrobial agents were determined through disc-diffusion method. It was found that all isolates were 100% resistant to (Ampicillin /Cloxacillin, Amoxicillin, Carbencillin, Oxacillin, Penicillin G and Ceftazipime, whereas they indicated variable resistance to the other antibiotics used. While Amikacin , Gentamicin and Imipenem revealed that were the most effective drugs used in the present study. Moreover K. pneumoniae isolated from sputum, urine and blood samples are more resistant to antimicrobial agents at percentages (78.9%), the most resistance isolates, 6 isolates were selected .The molecular detecting of some capsular polysaccharide genes (cps) were investigated by using PCR specific primers. Genotyping of 6 selected K. pneumoniae isolates were indicated by using K1,K2 specific PCR primers. The results were shown, that there is no isolate belong to K1 serotype, while 4 isolates (66.6%) are belonged to K2 serotype, and 2 isolates (33.3%) showed negative result for both K1/K2. جمعت 47 عينة أخذت من عينات سريريه مختلفة (الإدرار، مسحات الجروح، مسحات الحروق، القشع ,الدم, الخروج) للفترة من تشرين الثاني 2013 إلى كانون الثاني 2014 . شخصت 18 عزلة بكتيرية (%38.29) بكونها تعود إلى نوع , K. pneumoniae,11 عزلة (23.4%)E. coli, 9عزلات(%19.1S. ( ,aureus3عزلات, Psedomonase spp. (6.3%)عزلتان(%2.4) , K.terrigena4 عزلات(%8.5) oxytoca K. النتائج بينت ارتفاع نسبة عزلةe K. pneumoniaمن بين العزلات البكتيرية الأخرى اعتمادا على الصفات المظهرية ،الكيموحيوية و تم تأكيدها باستخدام نظام التشخيص بعدة الـ API20Eونظام VITEK 2 وكانت K. pneumonia الأكثر ترددا في عينات القشع تليها عينات الحروق، الخروج، الإدرار ،الجروح والدم بنسب مختلفة ( 33.3, 16.6, 16.6 ،11.1، 11.1 ،11.1) على التوالي.تم تحديد حساسية عزلات K. pneumoniae تجاه 19 مضادا حيويا شائعا باستعمال طريقه الانتشار بالأقراص. أظهرت النتائج جميع العزلات 100% مقاومة للمضادات Ampicillin /Cloxacillin , Amoxicillin, Oxacillin, Penicillin G Carbencillin , Ceftazipime في حين إن بعضها اظهر مقاومة متغايرة لعدد من المضادات الأخرى. بينما أظهرت العزلات ذاتها حساسية اتجاه المضادات Amikacin Gentamicin,و Imipenem. في حين عينات القشع, الإدرار والدم كانت الأكثر مقاومة للمضادات بنسبة ((78.9%.وبناءا على نتائج اختبار الحساسية اختيرت (6) عزلات تمثل الأكثر مقاومة لمعظم المضادات البكتيرية المستعملة . أظهرت نتائج الكشف الجزيئي لجينات متعدد السكريد باستعمال تقنية سلسلة التفاعل لإنزيم البلمرة (PCR) وببوادئ خاصة لتصنيع كبسولة البكتريا وحسب النمط المصلي (K1,K2 (،عدم وجود عزلة موجبة للنمط المصلي K1 و4 عزلات66.6%)) موجبة للنمط المصلي K2 وعزلتان (33.3%)كانت سالبة لكلا النمطين. A total of 100 clinical sample from (urine, sputum and swabs of wound , burn and ear) were collected from patients in different hospitals of Baghdad during the period from December 2013 to May 2014. 15 isolates (15%) identified belong to Acinetobacter baumannii, swabs of wounds were represented in high percentage of A.baumannii isolates (40%) while percentage of other samples were variable. Susceptibility of 15 A.baumannii isolates were tested toward 16 different Antimicrobial agents, the results showed all isolates were multi drug resistant. In addition, Polymerase Chain Reaction Technique (PCR) was performed to detection the resistance genes encoding the Oxacillinases enzymes. The PCR analysis showed that the presence of insertion sequence (ISAba1) in 13 isolates whereas blaoxa51like gene was represented in 12 isolates. Furthermore, the results of detection other genes were not appear any amplification for all A.baumannii isolates with genes encoded for bla oxa 58 and bla oxa 143 enzyme. شملت الدراسة 100 عينه سريريه ومن مصادر مختلفة (الإدرار،القشع،مسحات الجروح،مسحات الحروق ومسحات الإذن) من مرضى مستشفيات مختلفة في بغداد، خلال الفترة الممتدة من كانون الأول 2013 حتى مايس 2014.،شخصت 15 عزله(15%) تعود إلى Acinetobacter baumannii وكانت أعلى نسبه تشخيص تعود إلى مسحات الجروح(40%) وتغايرت نسبه العزل في مصادر العينات الأخرى.اختبرت حساسية عزلات بكتريا Acinetobacter baumannii باتجاه 16 مضاد حيوي، أظهرت نتائج الاختبار أن جميع العزلات كانت متعدده المقاومةللمضادات الحيويه. استخدم تقنيه Polymerase Chain Reaction Technique (PCR) للتحري عن امتلاك العزلات قيد الدراسة على الجينات التي تشفر إلى g(Oxacillinase) فوجد 13 عزله تشفر للتسلسل ISAba1، بينما 12 عزله كانت تحتوي على bla oxa 51 gene إما bla oxa58 gene and bla oxa 143 gene أظهرت نتيجة سالبه لكل العزلات. Antimicrobial agent --- Acinetobacter baumannii --- OXA 51. This research included isolation of 18 bacterial isolates from children stool with diarrhea and acute bloody water and under the age of five, if possible get a 9 isolates of the bacterium Escherichia coli and 5 isolates of the bacterium Salmonella typhimurium and 4 isolation of the bacterium Shigella flexneri, subjected all of these isolates tests AGRO and microscopic and biochemical and diagnosed using Vitek2 system. Tested the effectiveness of inhibitory extract alcohol to peel pomegranate Punica granatum L. in the growth of isolates bacterial intestinal and using the diffusion method in drilling Well diffusion as well as determine the focus damper Near Minimum inhibitory concentration MIC and focus killer Near Minimal bactericidal concentration MBC extract against these isolates bacterial, showed alcoholic extract of the peel pomegranate a clear impact on all isolates bacterial intestinal and this effect compared with the effect of 10 antibiotics included (Rifampicin, Amoxicilln, Ampicillin, Ciprofloxacin, Trimethoprim, Cefotaxim, Ceftriaxon, Neumycin, Tetracyclin, Chloramphenicol). Inhibitory effect of the alcoholic extract of peel pomegranate has been getting increasing with the concentration of extract, as the focus value of damper minimum MIC and focus killer Near MBC extract against all of the bacteria Escherichia coli and bacteria Shigella flexneri were 1 and 2 mg / ml, respectively, while the damper minimum focus MIC extract value against bacteria Salmonella typhimurium is 2 mg / ml while the killer is not specified minimum value of MBC focus extract against these bacteria. تضمن البحث عزل 18 عزلة بكتيرية من عينات براز اطفال مصابين بالاسهال المائي الحاد والدموي دون سن الخامسة، اذ امكن الحصول على 9 عزلات لبكتريا Escherichia coli و5 عزلات لبكتريا Salmonella typhimurium و 4 عزلات لبكتريا Shigella flexneri، اخضعت جميع هذه العزلات للفحوصات الزرعية والمجهرية والكيموحيوية وشخصت باستعمال نظام Vitek2. اختبرت الفعالية التثبيطية للمستخلص الكحولي لقشور الرمان Punica granatum L. في نمو العزلات البكترية المعوية وباستعمال طريقة الانتشار في الحفر Well diffusion وكذلك تحديد التركيز المثبط الادنى Minimum inhibitory concentration MIC والتركيز القاتل الادنى Minimal bactericidal concentration MBC للمستخلص ضد هذه العزلات البكترية، واظهر المستخلص الكحولي لقشور الرمان تأثيراً واضحاً في جميع العزلات البكترية المعوية وقورن هذا التأثير مع تأثير 10 مضادات حيوية شملت (Rifampicin، Amoxicilln، Ampicillin ، Ciprofloxacin ، Trimethoprim ، Cefotaxim ، Ceftriaxon ، Neumycin، Tetracyclin ، Chloramphenicol). وقد كان التأثير التثبيطي للمستخلص الكحولي لقشور الرمان يزداد بزيادة تركيز المستخلص، اذ بلغت قيمة التركيز المثبط الادنى MIC والتركيز القاتل الادنى MBC للمستخلص ضد كل من بكتريا Escherichia coli وبكتريا Shigella flexneri 1 و2 ملغم/مللتر على التوالي، بينما كانت قيمة التركيز المثبط الادنى MIC للمستخلص ضد بكتريا Salmonella typhimurium هو 2 ملغم/مللتر في حين لم يتم تحديد قيمة التركيز القاتل الادنى MBC للمستخلص ضد تلك البكتريا. Alcoholic extract --- Pomegranate peel --- Intestinal bacterial. In this work, samples of Cd2Si1-xGexO4 prepared by powder technology for (x = 0, 0.3, 0.6) were studied. The effect of (Ge) additives at different ratio of Ge (x=0, 0.3, 0.6) on the behavior of dielectric constant, dielectric loss and a,c conductivity were measured as a function of temperature at a selected frequencies (0.01 – 10) MHz in the temperature range 298 K to 473 K. The dielectric constant and dielectric loss obtained different behavior with the additives of (Ge). The activation energy for the electrical conduction process was studied. في هذا العمل , درست نماذج Cd2Si1-xGexO4 المحضرة بتكنولوجيا المساحيق للنسب (x = 0, 0.3, 0.6) . درس تاثير اضافة Ge لنسب مختلفة من Ge (x = 0, 0.3, 0.6). على ثابت العزل , فقد العازل والتوصيلية المتناوبة كدالة لدرجة الحرارة ولترددات مختارة (0.01 – 10) MHz في مدى درحات الحرارة 298 كلفن الى 473 كلفن. اكتسب ثابت العزل وفقد العازل سلوك مختلف باضافة Ge . تم دراسة طاقة التنشيط لعملية التوصيل الكهربائي. Recently, the environmental isotopes are adopted to figure out the hydrological processes, recharge areas, flow paths, groundwater origin and the interaction between different watery bodies. Currently, five samples of the rainwater have been collected since January to April 2012, as well as December 2011. Those sampling periods have highest amounts of precipitation events. Meantime, 25 samples of groundwater, 5 of the Lesser Zab River and 3 of overland flow have been picked up during the wet period. The dry sampling of groundwater and the Lesser Zab River has been achieved in summer 2011. The Local Meteoric Water Line lies between Global Meteoric Water Line (GMWL) and East Mediterranean Water Line (EMWL). The lowest, highest and average of δ18O in precipitation are -4.00‰, -3.60‰ and -3.84‰, while δ2H equal to -17.20‰, -14.00‰ and -15.60‰ respectively. The ranges of δ18O and δ2H of the Lesser Zab River in dry period are -3.12‰ to -2.82‰ and -12.80‰ to -12.00‰ sequentially. In the wet period, runoff samples are added to the Lesser Zab River. The lowest and highest of δ18O are -5.30‰ and -4.87‰ respectively, while δ2H extends from -30.00‰ to -28.65‰. Groundwater samples have δ18O and δ2H increased with well depths somewhat. Signatures of the wells have been fallen into two groups within two sampling campaigns; dry and wet periods. The first well samples are dropped above the GMWL and the second samples are classified below the GMWL. مؤخرا تم اعتماد تطبيقات النظائر لتخمين العمليات الهايدرولوجية ، مناطق التغذية ، مسارات الجريان ، اصل المياه الجوفية اضافة الى الفعاليات المشتركة بين البيئات المائية المختلفة. جمعت خمس عينات مطرية شهريا من منطقة الدراسة خلال كانون الثاني ولغاية نيسان 2012 , اضافة الى شهر كانون الاول 2011. شهدت فترات النمذجة اعلى كميات مطرية ممكنة. في تلك الاثناء تم التقاط 25 عينة من المياه الجوفية علاوة على 5 عينات مثلت مياه نهر الزاب الاسفل و 3 عينات من مياه السيح المطري. كما تم نمذجة 25 عينة مياه جوفية و 5 عينات اخرى من نهر الزاب الاسفل في فترة الصيف 2011. خط المياه المطري المحلي يقع بين خطي المياه المطري العالمي وشرق البحر المتوسط. بلغ اوطئ ، اعلى ومعدل الاوكسجين-18 في العينات المطرية -4.00‰ ، -3.60‰ و -3.84‰ على التوالي في حين بلغت قيم الديتيريوم -17.20‰ ، -14.00‰ و-15.60‰ على التوالي. كانت مديات كل من الاوكسجين-18 والديتيريوم في مياه نهر الزاب الاسفل خلال الفترة الجافة من-3.12‰ الى-2.82‰ و-12.80‰ الى-12.00‰ . اما خلال الفترة الرطبة فقد كانت مديات الاوكسجين-18 -5.30‰ الى -4.87‰ اما الديتيريوم فكانت -30.00‰ الى -28.65‰ ممثلة لمياه نهر الزاب الاسفل مع الاخذ بعين الاعتبار مياه السيح المطري. تميزت عينات المياه الجوفية بمحتوى نظائري للاوكسجين-18 والديتيريوم يتزايد مع عمق آبار المياه الجوفية. عموماً هنالك مجموعتان من عينات المياه الجوفية خلال فترتي النمذجة الجافة والرطبة ، احداها وقعت اعلى خط المياه المطري العالمي والاخرى اسفله. Stable Isotopes --- Local Meteoric Water line --- Groundwater Recharge --- Isotopic Variation. It is evident from this study that Yamama Formation is reservoir rocks and source rocks at the same time, based on occurrences of crude oil and source rocks. Bulk properties of Yamama oil in six wells as well as comparing several samples of Yamama oil by using the biological mark have indicated multi source of hydrocarbons with some pay having Jurassic and Lower Cretaceouse source affinity that belongs to the Yamama Formation. لقد تم أعطاء الأدلة من هذه الدراسة على أن تكوين اليمامة هو عبارة عن صخور خازنه ومولدة للنفط بنفس الوقت اعتمادا على تحليلات النفط والصخور المولدة. أكدت التحليلات الكلية لتكوين اليمامة باستخدام الأدلة البيولوجية مصادر متعددة للهيدروكاربونات ,إذ تكون بعض العطاءات تحتوي نفط يعود إلى نفس التكوين وعطاءات أخرى تكون عائديتها الى طبقات أكثر قدما من تكوين اليمامة. Crude oil analysis --- GC-MS --- Source rocks origin --- Yamama Formation --- S.W of Basrah. A series of adsorption laboratory experiments were conducted to study the sorption efficiency of bentonite in removal Cd from aqueous solutions. The bentonite was found to be a good receptive to the adsorption of Cd under specific laboratory conditions. The sorption capacity for Cd onto bentonite was investigated through the variation in pH and initial Cd2+ concentration. The sorption efficiency onto bentonite was examined as a function of pH, initial ion concentration, equilibrium reaction time and solid mass/ liquid volume ratio. The maximum sorption (%) of Cd from solutions were determined when solid to liquid ratio is 2 gm of bentonite versus 50 ml solution, the equilibrium reaction time is 50 minute at pH ranges from 5-7. The sorption was gradually increased with increasing concentrations of Cd in solution, it was found that the highest sorption was 81.7% when the Cd concentration in the solution was 80 ppm, but it suddenly declined to 72% with highest concentrations (100 ppm Cd) because of competing cations on the negative sites on the surface of clay minerals. أجريت سلسلة من التجارب المختبرية لدراسة كفاءة إمتزاز وإمتصاص البنتونيت في إزالة الكادميوم من المحاليل المائية. تبين أن البنتونيت تتقبل جيداً لامتزاز الكادميوم تحت الظروف المختبرية الخاصة. تم التحقيق من قدرة أمتصاص وأمتزاز البنتونايت لأيونات الكادميوم من المحاليل المائية من خلال تغاير درجة الحموضة والتراكيز الأولية للكادميوم. تم فحص كفاءة البنتونيت للامتصاص والامتزاز بوصفها دالة لدرجة الحموضة، وللتركيز الاابتدائية للأيونات, وزمن التفاعل في حالة الاتزان, ونسبة حجم كتلة / السائل الصلبة. تبين ان أقصى إمتصاص وإمتزاز للكادميوم (%) يحصل عندما تكون نسبة الصلب إلى السائل 2غرام الى 50 مل (بنتونيت : محلول) عند زمن تفاعل قدره 50 دقيقة في ظروف دالة حامضية تتراوح بين 5 الى 7. تبين ان الامتصاص والإمتزاز يزدادان تدريجيا مع زيادة تركيزات الكادميوم في المحلول، وإن أعلى نسبة كانت 81.7٪ عندما كان تركيز الكادميوم في المحلول 80 جزء في المليون، ثم تراجع فجأة ليكون 72٪ مع التركيز الأعلى (100 جزء في المليون الكادميوم) بسبب تنافس الكاتيونات ( الأيونات الموجبة فيما بينها) على المواقع السالبة الموجودة على سطح المعدن الطيني (البنتونايت). The petroleum system of Halfaya oil field shows that the hydrocarbon generation of these Formations such as Sha′uiba and Nahr Umr are immature and have generated few oil TR ≤ 50% which are neglected as compared to Formations below them which are very rich source rock. The Formations of Yamama, Ratawi and Sulaiy are mature with TR ≤ 100%. Other Formations such as Sargelu ,Najma,Zubair and Gotnia are with very high maturity with TR ≥ 100% and completely generated hydrocarbon and depleted after hydrocarbon are expelled and migrate to reservoir rock of structure traps and this study indicates that the major seals of Upper Jurassic are Gotnia and Allan Formations and of Middle Miocene is LowerFars fatha Formation. تمت دراسة النظام الهايدروكاربوني في حقل حلفاية النفطي في محافظة ميسان جنوب العراق .وأكدت الدراسة على ان نسبة تولد الهايدروكاربونات في تكويني الشعيبة ونهر عمر قليلة جدا حيث تصل نسبة التحول الهايدروكاربوني < من 50 % في حين أكدت الدراسة على ان تكوينات (الرطاوي ،اليمامة ،السلي )هي صخور مصدرية جيدة في تكوين الهايدروكاربونات حيث تصل نسبة التحول ≤ 100% في حين التكوينات (الزبير ،ساركلو ،نجمة ،القطنية )صخور مصدرية عالية جدا في تولد الهايدروكاربونات حيث نسية التحول ≥ 100% .أكدت الدراسة على ان هناك مظاهر تركيبية كفوالق وكسور ضمن الصخور المكمنية والمصائد التركيبية جعلت تكوين القطنية الذي يعود الى العمر الجوراسي وتكوين العلان يكون الحاجز العلوي للمحتوى الكاربوني في حين توقف تولد النفط ضمن تكوين الفارس الاسفل (تكوين الفتحة ). The Upper Campanian-Maastrichtian succession in Buzurgan oil field of Southeastern Iraq consists of Hartha and Shiranish formations. Three facies associations were distinguished in the studied succession. These include shallow open marine environment within the inner ramp, deep outer ramp and basinal environments. The Hartha Formation in the study area was deposited on a shallow carbonate platform with distally steepened ramp setting. The studied succession represents two 3rd order cycles. These cycles are asymmetrical and start with cycle A which is incomplete where the lower part of the Hartha Formation represents the deep outer ramp facies of the transgressive system tract.and the upper part of the Hartha Formation reflects deposition within the shallow open marine condition of the highstand systems tract. The overlying Shiranish Formation represents the transgressive system tract of cycle B only where it is basinal extent to Aliji Formation. The lower part of the Hartha Formation characterized mainly by microporosity, whereas the middle and upper part of the formation are less porous with interparticle porosity. This high porosity zone includ the lower part of the overlying Shiranish Formation. Where porosity is mainly intraparticle with moldic and fracture porosity being less dominate. The upper part of the Shiranish Formation is less porous. يتكون تتابع الكامباني الاعلى- الماسترختي في حقل بزركان النفطي جنوب شرق العراق من تكويني الهارثة والشرانش. تم تمييز ثلاث مجاميع للسحنات المجهرية تمثل : البيئة البحرية الضحلة وبيئة المنزلق الخارجية العميقة والبيئة الحوضية. يمثل تكوين الهارثة في منطقة الدراسة ترسيب في بيئة بحرية ضحلة على منزلق بعيد الانحدار. يمثل التتابع قيد الدراسة من دورتين ترسيبتين من الدرجة الثالثة. ظهرت هاتان الدورتان بشكل غير متناظرتبدأ الدورة Ạ والتي تكون غير مكتملة و يكون فيها الجزء الاسفل من تكوين الهارثة يمثل الترسيب في بيئة المصطبة الخارجية العميقة وتمثل نظام التقدم البحري. أما الجزء الأعلى من تكوين الهارثة فيمثل ترسيب بيئة بحرية ضحلة والذي يمثل نظام الترسيب العالي. أما تكوين الشرانش فيمثل فترة أرتفاع مستوى سطح البحرللدورةB حيث تستمر البيئة العميقة الى تكوين العليجي الذي يعلوه. الجزء الاسفل من تكون الهارثة يتميز بالمسامية المجهرية, بينما الجزء الاوسط والاعلى يكون اقل مسامية والتي تكون بشكل مسامية بين الحبيبات. نطاق المسامية العالية تميز الجزء الاسفل من تكوين شرانش والتي تكون مسامية داخل هياكل المتحجرات بصورة رئيسية بالاضافة الى مسامية قالبية والشقوق التي تكون اقل شيوعا. الجزء الاعلى من تكوين الشرانش يكون اقل مسامية. Campanian --- Maastrichtian --- succession --- Buzurgan --- Hartha --- Shiranish --- Aliji --- highstand --- transgressive. Three important electrode arrays in 2D imaging surveys were tested in this study through synthetic model to determine which array is the most successful in defining the vertical and horizontal geological structures. These arrays are Wenner-Schlumberger, Wenner and Dipole - dipole. The numerical modeling was created through vertical fracture zone and three separate cavities surrounded by horizontal layers. The results showed that the Wenner-Schlumberger is the most suitable electrode array when both vertical and horizontal structures are present in the subsurface. It is the best in imaging the vertical and horizontal contacts and represented these structures more accurately than the Wenner and Dipole-dipole arrays. اختبرت في هذه الدراسة ثلاثة ترتيبات كهربائية مهمة تستعمل في المسوحات ثنائية البعد من خلال موديل صناعي لتحديد الترتيب الاكثر نجاحا في تصوير التراكيب الجيولوجية العمودية والافقية. هذه الترتيبات هي فنر- شلمبرجر , فنر و ثنائي القطب. صمم الموديل العددي من خلال طبقات افقية تحتوي على نطاق تكسر عمودي وثلاثة فجوات متفرقة. اظهرت النتائج ان ترتيب فنر- شلمبرجر هو الاكثر ملائمتا" في حالة وجود مثل هذه التراكيب الجيولوجية معا , حيث صور الحدود العمودية والافقية بينها وبين الطبقات بدقة اكبر من باقي الترتيبات. Electrode Arrays --- Synthetic Model --- 2D Imaging Surveys. In this paper, the nonclassical approach to dynamic programming for the optimal control problem via strongly continuous semigroup has been presented. The dual value function VD ( .,. ) of the problem is defined and characterized. We find that it satisfied the dual dynamic programming principle and dual Hamilton Jacobi –Bellman equation. Also, some properties of VD (. , .) have been studied, such as, various kinds of continuities and boundedness, these properties used to give a sufficient condition for optimality. A suitable verification theorem to find a dual optimal feedback control has been proved. Finally gives an example which illustrates the value of the theorem which deals with the sufficient condition for optimality. في هذا البحث، تم تقديم اسلوب غير تقليدي للبرمجة الديناميكية لمسألة السيطرة المثلى بواسطة شبة الزمرة المستمرة بقوة. حيث عرفت دالة القيمة المواجهة VD(. , .) لهذه المسألة مع ذكر خصائصها، حيث وجدنا بان هذه الدالة تحقق مبدأ البرمجة الديناميكية المواجهة ومعادلة هاملتون جاكوبي –بلمان. كذلك تم دراسة بعض الخواص لدالة القيمة المواجهة أمثال أنواع متنوعة من الاستمرارية والحدودية ومن ثم استخدام هذه الخواص لإثبات المبرهنة التي تتعامل مع الشرط الكافي للامثلية. ايضا تم إثبات نظرية تحقيق مناسبة لإيجاد مسيطر تغذية استرجاعية مثلى مواجهة. وأخيرا تم إعطاء مثال يوضح قيمة النظرية التي تتعامل مع الشرط الكافي للامثلية. Dual value function --- Dual dynamic programming --- semigroup theory --- HJB equation --- Dual optimal feedback control. Extractive multi-document text summarization – a summarization with the aim of removing redundant information in a document collection while preserving its salient sentences – has recently enjoyed a large interest in proposing automatic models. This paper proposes an extractive multi-document text summarization model based on genetic algorithm (GA). First, the problem is modeled as a discrete optimization problem and a specific fitness function is designed to effectively cope with the proposed model. Then, a binary-encoded representation together with a heuristic mutation and a local repair operators are proposed to characterize the adopted GA. Experiments are applied to ten topics from Document Understanding Conference DUC2002 datasets (d061j through d070f). Results clarify the effectiveness of the proposed model when compared with another state-of-the-art model. التلخيص الاقتطاعي للمستندات النصية المتعددة – تلخيص يهدف الى ازالة البيانات المتكررة بمجموعة مستندات مع الحفاظ على الجمل المهمة التي تبرز المحور الرئيسي الذي تدور حوله هذه المستندات – حصل مؤخرا على اهتمام واسع من خلال اقتراح نماذج رياضية اوتوماتيكية لصياغة هذه المشكلة. هذا البحث يقوم باقتراح نموذج تلخيص اقتطاعي للمستندات النصية المتعددة مستند على الخوارزمية الجينية. حيث تم اولا نمذجة المشكلة كمشكلة افضلية متقطعة مع تصميم دالة ملائمة محددة للنموذج المقترح. والثاني هو استخدام تمثيل ثنائي مع موجه طفرة ومصحح محلي لمساعدة الخوارزمية الجينية المتبناة. التجارب طبقت على عشرة محاور من مجموعة البيانات العالمية DUC2002 وقد اظهرت النتائج فعالية النموذج المقترح عندما تمت مقارنته مع أحدى النماذج الحديثة. Text summarization --- genetic algorithm --- local repair --- content coverage. Pulsar stars are rotating Neutron stars can be divided into two types Millisecond and Normal Pulsars. In this work the magnetic field are concentrated depends on the period (P), and Period derivative (P) for a sample Normal, Millisecond and Radio stars which adopted. In addition, the values of spin down luminosity and Heating rate are determined by depending on (Ostriker and Gunn) model. The results showed that older Millisecond define as having greater ages specified how long pulsars lives at that ages very long period pulsars to be observable have particularly large surface magnetic field. The results indicate that spin down of luminosity for Millisecond and Normal star must due to the main energy loss rotation axis to align with magnetic axis as pulsar age. In addition, the Heating rate decreases with the star’s age, beside Characteristic age calculated.النجوم النابضة هي نجوم نيوترونية دوارة تقسم إلى قسمين هي نوع الملي ثانية والاعتيادية. في هذا البحث تم التركيز على تأثير المجال المغناطيسي اعتماداً على فترة الدورات (P) ومشتقة الفترة (P) لعينة من نجوم الاعتيادية والملي ثانية والراديوي. بالإضافة إلى ذلك تم تعيين قيم تباطؤ اللمعانية ونسبة التسخين بالاعتماد على نموذج (Ostriker and Gunn). النتائج أوضحت أن النجوم من نوع ملي الثانية القديمة التكوين هي تملك أعظم عمر مميز حيث يمكن وصف ان هذه النجوم هي التي تملك اطول فترات زمنية دورانية نابضة حيث يمكن رصدها عملياً بمجال مغناطيسي افقي عالي. بينت النتائج ايضاً ان تباطيء اللمعانية لنجوم الملي ثانية والنجوم الاعتيادية النابضة يرجع الى خسارة الطاقة حيث محور التدوير يميل الى ان ينطبق مع المحور المغناطيسي مع تقدم عمر النابض. نسبة التسخين تقل مع عمر النجم وكذلك تم حساب العمر المميز. Pulsar --- Neutron stars --- Magnetic field --- MSP Pulsars. Feature extraction provide a quick process for extracting object from remote sensing data (images) saving time to urban planner or GIS user from digitizing hundreds of time by hand. In the present work manual, rule based, and classification methods have been applied. And using an object- based approach to classify imagery. From the result, we obtained that each method is suitable for extraction depending on the properties of the object, for example, manual method is convenient for object, which is clear, and have sufficient area, also choosing scale and merge level have significant effect on the classification process and the accuracy of object extraction. Also from the results the rule-based method is more suitable method for extracting most features, since it depends on different variable which belong to the objects. استخراج الميزة توفر عملية سريعة لاستخراج الية الكائن من بيانات الاستشعار عن بعد للمخطط الحضري باقصر وقت او مستخدم نظم المعلومات الجغرافية اذا مااستخدمت الحسابات التقليدية..في العمل الحالي تم تطبيق ثلاث طرق ( (manual, rule based, classificationاعتمادا على( (object-base approach لتصنيف الصورة .من النتائج التي تم الحصول عليها ان كل طريقة تكون مناسبة للاستخراج اعتمادا على خصائص الكائن ،على سبيل المثال الطريقة اليدوية تكون سهلة ومريحة بالنسبة للكائن الواضح والمساحات الكافية ،وكذلك اختيار حجم و مستوى الدمج لها تأثير كبير على عملية التصنيف ودقة استخراج الكائنات ومن النتائج ايضا تبين ان طريقة (rule- based) هي انسب طريقة لاستخراج معظم الميزات كونها تعتمد على اكثر من خاصية تخص الكائن. In this paper, the satellite in low Earth orbit (LEO) with atmospheric drag perturbation have been studied, where Newton Raphson method to solve Kepler equation for elliptical orbit (i=63°, e = 0.1and 0.5, Ω =30°, ω =100°) using a new modified model. Equation of motion solved using 4th order Rang Kutta method to determine the position and velocity component which were used to calculate new orbital elements after time step (∆t) for heights (100, 200, 500 km) with (A/m) =0.00566 m2/kg. The results showed that all orbital elements are varies with time, where (a, e, ω, Ω) are increased while (i and M) are decreased its values during 100 rotations.The satellite will fall to earth faster at the lower height and width using big values for eccentricity (e) and (A/m) ratio. Were the results got lifetime at height = 200, e = 0.1 equal 11 days for A/m =0.02 m2/kg, while satellite's lifetime at height = 200, e = 0.1 for A/m = 0.09 m2/kg equal 6 days. تم في هذا البحث في دراسة المدار المنخفض للقمر الصناعي بوجود اضطراب كبح الغلاف الجوي ، حيث استخدمت طريقة نيوتن رافسن لحل معادله كبلر لمدار القطع الناقص لـi=63°، (e = 0.1، 0.5) Ω=30° ω=100° باستخدام نموذج مطور لحساب تغير العناصرالمدارية بوجود الاضطراب. تم حل معادلة الحركة باستخدام طريقة رانج كوتا للمرتبة الرابعة لحساب مركبات الموقع والسرعه للقمر الصناعي التي تستخدم لحساب العناصر المدارية الجديده بعد زمن ( (∆tللارتفاعات 100، 200، 500 km))، A/m =0.00566 m2/kg. النتائج بينت ان كل العناصر المدارية تتغير مع الزمن، حيث ان العناصر (a، e، ω، Ω) تتزايد قيمها بينما العناصر(i ،M) تتناقص قيمها خلال 100 دورة للقمر الصناعي. القمر الصناعي سيسقط نحو الارض خلال وقت اقصر عند المدارات الواطئة ولقيم A/m وللشذوذ (e) الكبيرة حيث ان عُمر القمر الصناعي 11يوم لـA/m = m2/kg 0.02، e=0.1 ، بينما يكون عُمر القمر الصناعي يساوي 6 ايام لـ A/m = m2/kg 0.09 ، e=0.1 .